Most people are familiar with renting when it comes to apartments and cars, but when it applies to bridal parties and weddings, rentals take on a whole new meaning. Rent what you need to pull off your dream bridal party today by visiting your local wedding planner or rental dealer. Everything you need from tents, chairs, décor, and even your dress can be rented at very affordable prices! Be sure to ask many questions when renting and planning your party so that nothing is left out. Your dream is just as important to the rental company as it is to you. We will make sure to tackle everything you need to pull your bridal party off. The venue, the food, and the decor for your bridal party are going to be the three most important choices you make for the bridal party. Because a lot of your costs will be in gifts to your guests, make sure to rent what you need where it applies. If you are opting to have an outdoor bridal party, then the first item on your to do list is to rent a tent. To be clear, bridal tents are not like normal party tents. 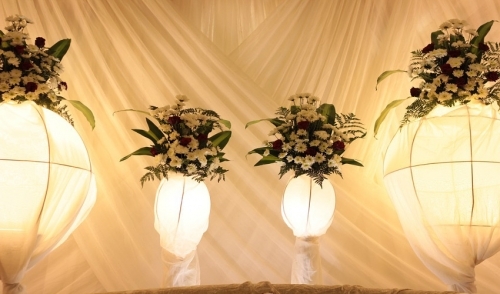 Normal party tents are simple and easy to install whereas a bridal tents are so much more. In most cases, wedding tents are bigger, more elaborate, and come with more attachments such as lighting and even air conditioning. There are two main options to choose from, pole tent or frame tent. Both styles of tents are great options and are aesthetically pleasing based on how you set it up. The real factor to consider will be the attachment such as a liner, flooring, walls, lighting, and heating/cooling. Based on the type of bridal party you are throwing and the size of your bridal party, you will need to plan according to have the right size tent and the right attachments when the time comes. All of this would cost you a lot if you purchased it which is why you should rent a tent if the party is outside or rent extra chairs or tables if you need it. When it comes to food you should also look into renting dishware and chafers for the food you plan to serve. Even if you have a family friend doing the catering, don’t be afraid to help out by renting some essentials to help the party run as smoothly as possible. As any smart person will tell you, it’s always better to have something and not need it than need something and not have it. The last thing you will need to really rent for is the décor of your party. Everything from centerpieces to antique goods you can rent to fit the theme and vision of your party. Don’t be afraid to ask and inquire if something can be done. Rental dealers are more creative than you think. Due to the fact that money is one of the biggest limiting factors when it comes to weddings and bridal parties, there’s no shame in cutting corners where you can to save a buck or two. Rental dealers can truly help make your dream a reality, so visit your local shop today and get started. © 2019 Taylor Rental of Wallingford, CT. All rights reserved.